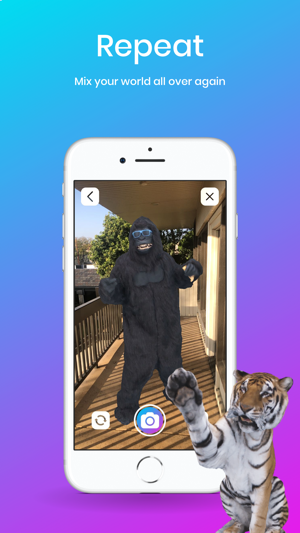 Holo lets you add holograms of real people and animals into your world and take photos & videos to share with friends. 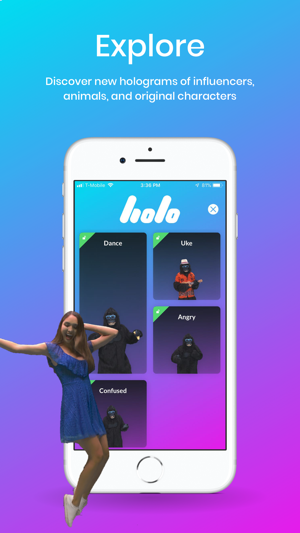 Optimized for phones with ARKit, Holo is the the first app that lets you move around 3D holograms of people and interact with them as if truly there in real life, giving you an entirely new way to create content and tell stories with personalities you love in AR. Selfie mode! Now you can take pictures with your favorite influencers. The all-new design is optimized for taking pictures with the front facing camera that you can post to social media. Choose from a mix of free and premium content to use for your posts. This shows the future of technology. This app is great! Especially for a mobile device, this technology is impressive! The content library is small, but that’s normal for an app that is just starting out. I also like that you added the dynamic color correction, as it works really well! My two suggestions would be to allow one to place multiple objects at once (imagine a dog, a raccoon, a pirate and a tiger in one shot!) and to allow one to add images of the same type from other sources (I’m sure there must be free resources with other images in the same format somewhere? This would allow the user to use both the stock ones and other ones that exist online). Keep up the great work! I love this app, it’s so fun and very easy to use. I would give it a 5 star, but there need to be a little bit more user friendly. You should be able to use backgrounds from the camera roll if you choose to, or even you videos/photos from the camera roll. Sometime you just can’t get out to take pictures or even use your video camera. If you add this to the app, I will give a 5 star review. Also can you fix it so that we can use it with a selfie. I see all kinds of potential for viewing and listening to holograms in the education environment. I am incredibly impressed. 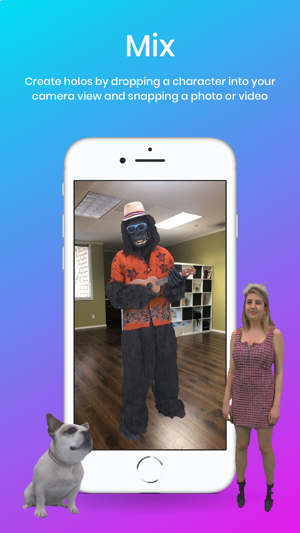 If you could deploy hologram recording studios throughout the country such as in malls and also make it simple to send that hologram to other users of the app(s), your company would make a fortune.